THERE'S something infinitely charming about wandering through ancient cities. The wonderment of what came before. Darting in and out of ruins imagining what life must have been like for the previous inhabitants. Petra and Jerash are two such marvels in Jordan that are must-sees in the Middle East. Petra - one of the new seven wonders of the world - is carved into the rose-coloured rocky mountains in the country's south. Considered an architectural masterpiece, the once "lost" city is also significant for strategic reasons. 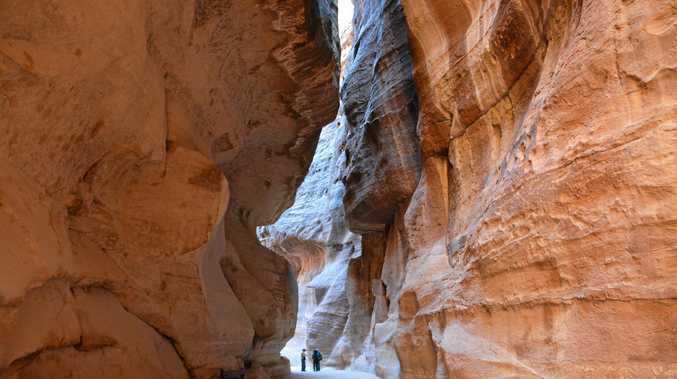 Inhabited since prehistoric times, it was turned it into a caravan trading centre for Arabian incense, Chinese silks and Indian spices by the Nabatean civilisation. While there are some free-standing buildings, many are carved into the rock and must have taken many years to create. Entry is through mountains riddled with passages and gorges, which kept the city hidden from westerners for a long time. It's a bit of fun as you turn the corner in the Siq - a narrow passage leading to the rose city - to see the treasury building made famous at the end of an Indiana Jones movie. If you get there early enough you can even catch a selfie without the hordes of tourists who arrive later in the day. For a more special treat that not all tourists go to, hike the 900 rock steps to the Monastery building. If you're a fan of the Transformers on the big screen, the Monastery might look rather familiar too. It's a bit of a hike - about 45 minutes to an hour to rise and 30-40 minutes to descend but well worth it. Take a picnic lunch and set yourself up at one of the viewpoints just above the Monastery to take it all in. Back down in the valley, the street of tombs makes for a gorgeous photo from a distance. Ducking and weaving through the almost secret passageways in the tombs to find yourself on the edge of a mini cliff face, then working out how to get to the next tomb, is a great adventure. If you're not already tuckered out after seeing the colonnaded street, the church and the tombs then you can run up another 600 steps to the high place of sacrifice too. Jerash, just north the capital of Amman, is a striking scramble of ancient ruins set against a typical Middle East city. The ruins of colonnaded streets, temples, baths, arches and an amphitheatre evoke images of togas, leafy headdresses and great feasts. Sitting in the theatre is another great chance to reflect on what shows they came to watch. Walking up the colonnaded streets, you can picture the bustling community that once was. Hidden for centuries under sand until its restoration over the past 70 years, Jerash is considered one of the best-preserved Roman provincial towns but the Arabic influences on the once popular trading hub are evident too. These two cities are just some of what Jordan has to offer. And the country's close proximity to Israel means Jerusalem and Bethlehem are also a stone's throw away.